Rabbit In The Headlights: Surprise! AWE.SOME. That is so completely cool! I've never had a surprise party, but to have friends fly in? That's way cooler than anything I've heard of. Beach. Turning 40. Parties. Snuggies. Could your life BE any better? Do you really want to start the game of posting really bad pictures of each other on our blogs. Seriously, I look like Mr. Ed. But Cher's daughter became a man? I have something to google now! I LOVE that book, my mom got it for me as a stocking stuffer last year. My favorite is going #3. By the way you look like you've lost quite a bit of weight. You don't look a day over 21. And I'm not just saying that because I want your snuggie. Why is my mascara running down my face you ask? I just read this post and laughed until I cried! You are such a dork! That is why we are friends! What great friends. I have read that book at Shay's and laughed my (well you know) out. You look so comfy and warm in your snuggie! You look MUCH better than the lady in the Snuggie picture! Hey, why don't you get your make-up done at Norstroms before posing for the photo shoot? Thanks for the fun time! Just looking at you makes me laugh (in a good way). Awww. You know if I'd known, I would have flown in for you, too. Happy, happy, happy 40th! 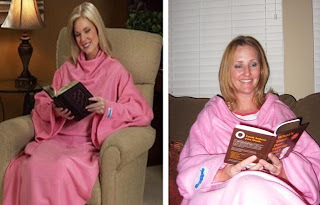 So can you use the loo while wearing a snuggie? Inquiring minds want to know. You look beautiful in your Snuggie. 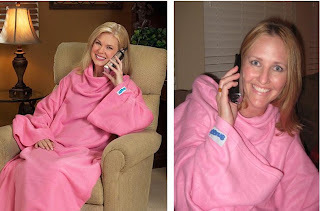 I'm so glad the Snuggie made your blog! And btw YOU are soooo much prettier than the lady on the box! Happy 40th!